VietNamNet Bridge - Approximately 80 tons of fish died without a clear cause along the central coast of Vietnam, from Ha Tinh to Thua Thien Hue province. It was guessed that the fish died becauseof a powerful toxin in the sea water. On April 27, the Ministry of Environment and Natural Resources announced two causes of this tragedy: Red tide and poisonous chemicals. 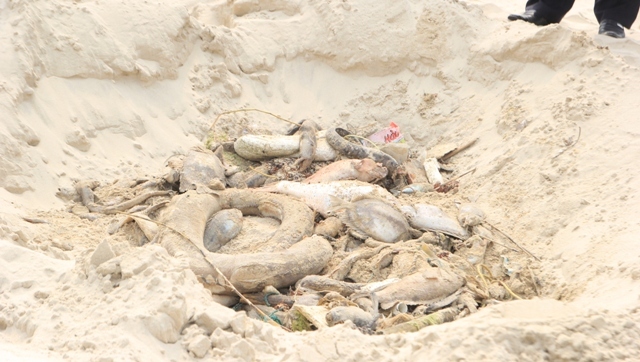 April 4: Fish began dying massively along the coast of Ha Tinh Province, totaling 10-15 tons. April 14: The abnormal phenomenon spread to the coast of Quang Binh and Quang Tri, with about 25 tons in Quang Binh and 30 tons in Quang Tri. April 15: Massive death of fish was reported in Thua Thien – Hue Province, with about 6,000 fish. Fishermen reported that about 3-5km from the Vung Ang Industrial Zone in Ha Tinh Province, fish died massively. Some locals dove into the sea and detected a pipe from the IZ, which discharged waste water with bad smell to the sea. The Ministry of Agriculture and Rural Development instructed relevant bodies to immediately investigate the cause of the abnormal death of fish. On April 23, a meeting was held with the participation of leaders of Ha Tinh province and officials from the related ministries and agencies. On April 25, Prime Minister Nguyen Xuan Phuc instructed related agencies to quickly clarify the causes of the massive death of fish along the central coast. At the same time, Deputy Prime Minister Truong Hoa Binh asked relevant bodies to inspect huge waste water pipes under the seabed of Vung Ang. Deputy Prime Minister Trinh Dinh Dung assigned the Ministry of Environment and Natural Resources to combine with other bodies to investigate the causes of the death of fish, even seeking international assistance. Regarding this case, Phan Van Khoa, Director of the Department of Agriculture and Rural Development of Quang Binh Province said initial tests of water and fish samples showed that the fish was not killed by bacteria or virus but by toxins in the water. Pham Khanh Ly, Vice head of the Department of Aquaculture of the Ministry of Agriculture and Rural Development said it must be an extremely strong toxin that could kill such a huge volume of fish in many provinces. 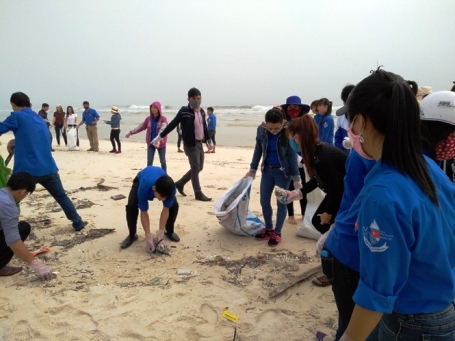 Dang Ngoc Son, Vice Chair of Ha Tinh Province, recommended that local people and tourists can still eat alive seafood and swim in the sea normally. Deputy Minister of Natural Resources and Environment Vo Tuan Nhan said that the waste water pipe in the seabed of Vung Ang belongs to Taiwanese-invested Formosa steel firm and the work was licensed by the authorities. Before discharging waste water to the sea, Formosa must complywith rules of Vietnam. While the authorities are struggling to deal with the mass fish deaths in the central coast, an official of Formosa sparked public outrage by stating people must make the false choice between a massively polluting steel industry or fishing. On April 25: Chou Chun Fan, public relations director of Hung Nghiep Formosa Ha Tinh Steel Ltd., under the Taiwan's Formosa Group, decided to address the issue. He said there was no way fish could live around a steel factory. "Of course, we tried to meet national standards but we have to exchange something for the project. Previously, the farmers could still harvest a rice crop there once a year but now there's no crop, there's a factory. Sometimes, we can't have it all, we have to choose. Do we want to fish or do we want to develop a modern steel industry?" he said. On April 26, leaders of Hung Nghiep Formosa Ha Tinh had to apologize for Chou Chun Fan’s statement. Chou Chun Fan was also fired. At a press conference on April 27, Deputy Minister of National Resources and Environment Vo Tuan Nhan said that red tide and poisonous chemicals in wastewater were the two main factors behind the massive fish deaths along the north-central and central coastline. 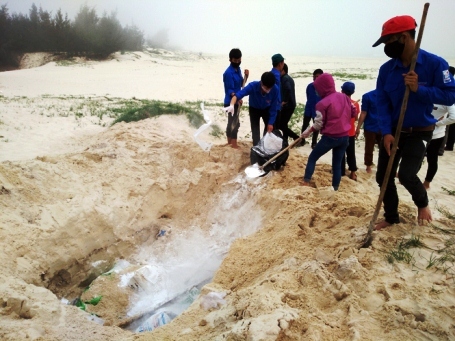 The Ministry of Natural Resources and Environment claims that there was insufficient evidence that Formosa and other plants in the Vung Ang Economic Zones in Ha Tinh Province were responsible for the mass fish deaths along the central coast. "As of this time we don’t have any evidence to prove a link between Formosa and other plants in the Vung Ang Economic Zone to have been responsible for the mass fish deaths," Nhan claimed in his report. "The investigations by scientists and environmental experts on water samples from the area found no substances that exceeded legal levels." According to the report, it is necessary to further study these two ‘possible’ causes to find out an exact cause and decide measures to prevent similar disasters in the future. The Ministry of Science and Technology will be in charge of these studies and can invite international scientific organisations to help. The Ministry of Agriculture and Rural Development will soon announce their analysis of toxic substances on water samples and give necessary warnings on the fishing activities in the areas, the report said. The long-delayed announcement was met by profound disappointment of local media and the public who believe many questions still remain. However, the Vietnam Fisheries Association has not acknowledged the red tide conclusion and asked the Government Office, the Ministry of Natural Resources and Environment, the Ministry of Agriculture and Rural Development and the Ministry of Finance to continue their investigations. The association agreed that the fish had been poisoned because most of the dead fish were deep-sea creatures but said that there was no evidence to prove that the fish were killed by the natural phenomenon known as a red tide. They said the water colour should have changed, and even fish living on the surface would be killed and they should have found algae on the shore. In addition, Vietnam has not registered any earthquake, tsunami or volcanic activity that could affect the sea floor. The association said it was highly likely that the disaster was human caused. Some people raised concerns that if fish were poisoned then it was possible that all marine life had been killed. Fishermen want to know if how long the sea would stay dangerous and whether it could be cleaned up as the mass fish deaths were badly affecting the livelihoods of everyone. The association proposed to support each family that have been affected with 15kg of rice. The authorities were also urged to be quick in collecting dead fish from the beach so that they couldn’t be sold. Dr. Nguyen Tac An, former director of the Nha Trang Institute of Oceanography, also said that it was unconvincing to say that red tide was one of the two reasons that killed fish along the central coast of Vietnam. Dr. An said the first thing to realize the phenomenon of red tide is the change of color; the sea surface will become dark red. Satellites can take photos of the phenomenon. On the other hand, the sea water will smell badly because of dead algae. He said if this phenomenon occurs, the local governments and local people could see it. In addition, the red tide kills fish in the surface layer of the sea, not at the bottom layer while in fact the dead fish along the central coast of Vietnam were the fish living in the bottom layer. "The competent authority said that red tide is one of the two causes of dead fish in the central region but the scientific basis for it is very weak," he said. Former Director of the Nha Trang Oceanography Institute said that the fish died massively because of the lack of oxygen, toxins or the construction of underground works that cause serious pollution to the water. Therefore, only when the toxins are accumulated in a long time, spread out widely, then large fish living in the bottom layer die and washed ashore. Many experts also had the same idea. 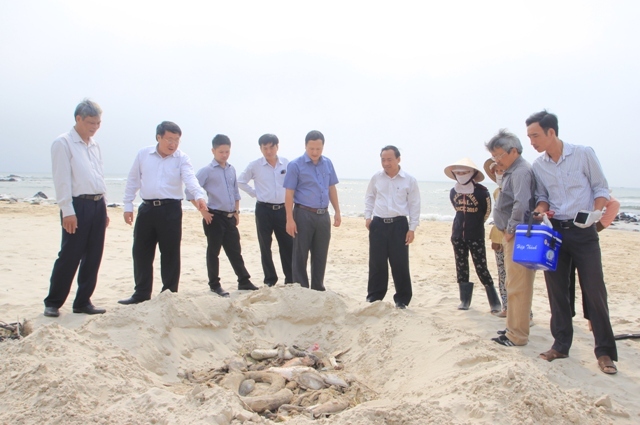 On April 28, Minister of Natural Resources and Environment Tran Hong Ha together with representatives from the Vietnam Academy of Science and the Nha Trang Institute of Oceanography and scientists had a field trip to the waters where dead fish was found and inspected waste discharge facilities of the Formosa Ha Tinh Corporation. They took water and sediment samples there for examination to determine whether water is contaminated with heavy metals and deal fish affect people’s health. Minister Ha frankly admitted shortcomings and limitations in coming up with the causes behind the mass fish deaths, saying that this was a very big and serious environmental disaster that has occurred in Vietnam for the first time, resulting in slow response by relevant ministries and agencies. He promised that the State management agencies will do their utmost to clarify the fish death causes with a sense of justice and in a scientific manner. 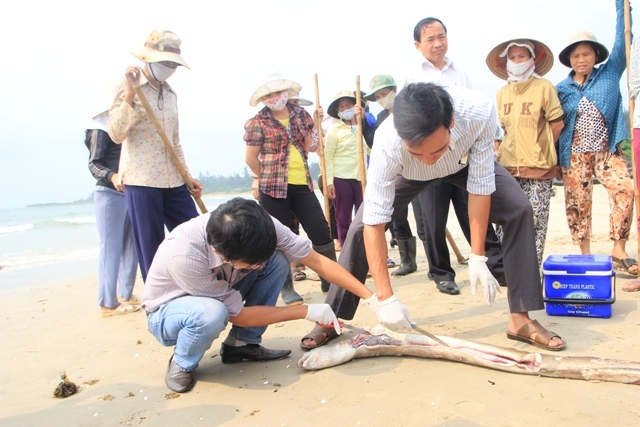 On April 29 Prime Minister Nguyen Xuan Phuc requested relevant ministries, agencies and localities to take comprehensive measures to deal with mass fish deaths along the central coast. Red tide is a common name for a phenomenon known as an algae bloom (large concentrations of aquatic microorganisms) when it is caused by a few species of dinoflagellates and the bloom takes on a red or brown color. Red tides are events in which estuarine, marine, or fresh water algae accumulate rapidly in the water column, resulting in coloration of the surface water. It is usually found in coastal areas. It kills many manatees every year. These algae, known as phytoplankton, are single-celled protists, plant-like organisms that can form dense, visible patches near the water's surface. Certain species of phytoplankton, dinoflagellates, contain photosynthetic pigments that vary in color from green to brown to red. When the algae are present in high concentrations, the water appears to be discolored or murky, varying in color from purple to almost pink, normally being red or green. Not all algae blooms are dense enough to cause water discoloration, and not all discolored waters associated with algae blooms are red. Additionally, red tides are not typically associated with tidal movement of water, hence the preference among scientists to use the term algal bloom. Some red tides are associated with the production of natural toxins, depletion of dissolved oxygen or other harmful effects, and are generally described as harmful algal blooms. The most conspicuous effects of these kinds of red tides are the associated wildlife mortalities of marine and coastal species of fish, birds, marine mammals, and other organisms.